Were you suddenly startled when you look at the mirror to find that you already have some fat deposits on your chin? 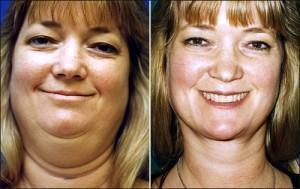 Commonly known as double chin, oftentimes it is a visible sign that gained weight. But still there are various causes why having it happens such as genetics and age. Having this will make you look fatter and older, that’s why if you are looking for ways on how to lose double chin fat fast, and then here are the tips on how to get rid of it. Read on. Double chin loss can be achieved by limiting your caloric intake, and reducing the sources that can make you fat. Eat a proper diet which includes salad, fruits, vegetables, and low – calorie food. Perform double chin exercises for a few minutes everyday. Open your mouth as wide as you can, then stretch your lower lip and jaw to the top row of your teeth, this is called the platysma exercise which can tighten you muscles in the neck and chin thus aid in losing it. Another exercise is to utter the vowels while leaning your head upward facing the roof. Apply Velform Wrap System twice a day. This tones your neck and chin as well as reduces the fat from them. Stop the unattractive fat hanging from your chin. Follow these tips on how to lose it fast and do not wait for it to become triple chin. Good luck! Nice article. As for me, I hate my cleft chin fat. I want to get rid of it.